Home SKINCARE Cure for Dry, Itchy Skin! This review is long past due. I had the opportunity to try out some new skincare products from Beaute Starr. It took me a few months to recover from past skin irritations before I was ready to try some new products. Better late than never right? The company sent over their new face mask as well as their Coconut Oil for me to try out. Virgin coconut oil is different from regular coconut oil on the market. Believe me, I've purchased some before from my local Farmer's Market and it's not the same. I have this chronic problem with dry, itchy, rough skin on my neck that flares up at one point every year. I'm not sure if it's allergies or a skin condition but it's really annoying. I've tried a lot of products to cure it but most do nothing to relieve the itchiness and dry skin. The condition usually lasts for a few weeks and then hopefully goes away. The only other product I found that sort of worked was Lush's Dream Cream. However, it was a little on the expensive side and more of a temporary solution. I wanted to see how the "Just Coconut" Virgin Coconut Oil worked. I tried this product on my neck. It's not really an oil, it's more of the consistency of shea butter. The benefits of Coconut oil are amazing...you can use it on your skin or hair. My girl BeautyLogic used to talk about how it made her non-growing hair basically sprout and now she has the most gorgeous, long hair I've ever seen. The oil is also great for curing dry skin, eczema and other skin conditions. I love how it's a natural cure and not filled with chemicals that I can't even pronounce. You can read about the benefits here. I used it on my neck and wow, all the itchiness that kept me up at night is gone! Over the last few weeks, my neck has softened and is not itchy. It's a miracle! I need to apply it daily to keep the curing process going but I am thoroughly impressed! I have definitely incorporated the Virgin Coconut Oil into my daily facial regimen for the last several weeks. I can also see it making a permanent fixture into my skincare routine. This product claims to be botox in a bottle. The mask is intended to help firm up loose skin. The main ingredients are all natural Volcanic Ash...the same ingredients in the super popular MAC products. The first time I used it, I noticed that my skin indeed felt super tight. It really does feel like a face lift. You'll notice when the product is drying because your face feels tighter and tighter. You're supposed to wash it off with a washcloth to make sure you get all the product off. The first time I used it, I had a tiny allergic reaction at my hair line. A few bumps popped up which often happens to me when testing new products. They went away after about a day. I was a little reluctant to try to the product after that but decided to really give it a shot. I used it two more times and had no issues. Days after, my skin still felt tighter and lifted. Since I have sensitive skin that tends to be on the dry side, I applied the mask to wet skin. This alleviated an itchy feeling I had earlier. If you have any issues of loose skin, you can even go to the website to take a skin elasticity test. Use this once a week to get maximum results. I would choose this face mask over botox anyday, lol. FYI, the labels on the products are printed paper stickers. I had these products by my sink and water splashed on them. After a while, you can't really read the label because the ink had smeared. I'd recommend storing this away from water and in your medicine cabinet or drawers. You can check out these products at www.beautestarr.com. The company is run by an experienced makeup artist who has just about tried everything. The site isn't super impressive looking, but I do vouch for the products. The products are priced a bit more than average drug store skin care...but it appears that these products are used out of the company's spa and boutique, which explains the price. 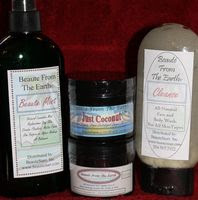 In sum, I definitely recommend the Just Coconut for those with super dry, itchy skin conditions. I might try getting the unrefined coconut oil from Wholefoods and see how it compares. I don't really see myself using the Botox Mask on the regular since skin firming is not a major concern of mine right now. Still, I can see it being great as a preventative measure or for mature skin. FTC Disclosure: These products were sent for review by the company. I was not paid to write this review and am not affiliated with the company. hi ms. ren. how about for OILY SKIN?. please give me some tips..
Coconut oil helps prevent acne by keeping the skin soft and supple. Apply coconut oil daily to your skin to heal, moisturize and soothe it. Apply coconut oil to irritated or chapped lips as well; it's edible, so it's safe and so healing to the lips.